London’s most celebrated actress, Miss Kitty La Bijou, has almost achieved her heart’s desire. Mistress to handsome Lord Nash and the unacknowledged illegitimate daughter of Viscount Partington, she has fame, beauty and the affections of the handsome lover she believes was predestined for her. But the respectability she craves eludes her. When Kitty stumbles across Araminta, her nobly born half-sister, on the verge of giving birth barely seven months after marrying dangerous Viscount Debenham, Kitty realises respectability is no guarantee of character or happiness. 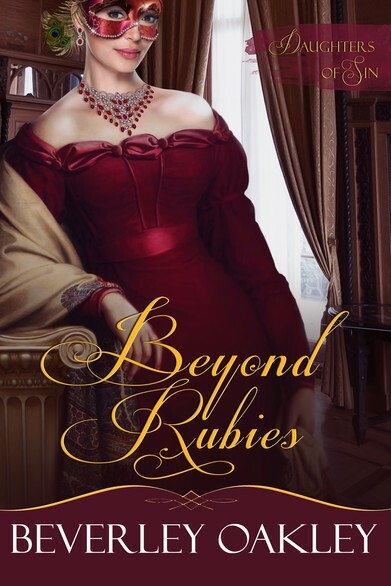 However, helping Araminta has unwittingly embroiled Kitty in a scandalous deception involving a ruthless brothel madam, a priceless ruby necklace and the future heir to a dazzling fortune. And when Kitty finally receives an offer of marriage from unexpected quarters, that will seemingly solve all her problems, she must choose. Respectability or love? What is the Daughters of Sin series about? The Daughters of Sin series is a Regency-set ‘Dynasty’ for those who like their historical romance full of drama and laced with mystery and intrigue. It features four sisters – two nobly born, the other two, illegitimate – who compete for love during an exciting London season while each seeks dangerous Lord Debenham for very different reasons. And all other retailers here. Kitty glanced up at the flaking wooden door in the laneway and then down at her fashionable fuller skirts—well, they were fashionable last year, and she was not, after all, trying to compete with any society miss but, rather, with the other hopeful actresses who sought to land the lead role in this production of Romeo and Juliet. Unlike her mother or Lissa, Kitty wasn’t good with a needle and thread, otherwise she’d have worked magic and turned her gown into the height of fashion. She’d been delighted when Lissa had proudly spurned it with the lofty claim that serviceable serge and cotton would do well enough for her while she was a governess in the Lamont household; proving to the world that she was a more worthwhile creature than the cosseted Araminta and Hetty, and, by inference, living by a higher moral code than Kitty. At least, that’s how Kitty interpreted it. Kitty, by contrast, was more than happy to wear Araminta’s castoffs which would serve her well in the theater where she was confident she’d meet her heart’s desire—the gentleman whom she’d know with the exchange of a single smoldering, impassioned look. This scion of the nobility would pluck her from her lowly status, recognize her worth, brand her his, and ultimately make her his wife. It had all been prophesied, and Kitty was looking forward to lording her newfound status over her half-sister, Miss Araminta Partington, whom she was determined would not only notice her, but desire above all to swap places. For now, Araminta did not even know Kitty existed. And when Miss Kitty La Bijou was a name on everyone’s lips, she’d visit Lissa, who’d been so unhappy in her London job, and who’d loathed lazy Mrs. Lamont who believed herself so much grander than she was, and spoiled Miss Maria Lamont, who was embarking upon her first season with all the airs of a duchess, and offer to take her sister away from her awful life. Kitty, for once, would be her older sister’s savior. The slight difficulty was that although Kitty was now in London, she had no idea how to find Lissa. Her sister had unexpectedly left the Lamont household to live with a dressmaker, where she continued doing her sketches, from what Kitty could gather, though how she could keep body and soul together in such employment was a mystery. And Lissa had left no forwarding address. Not that Kitty intended staying with Lissa. She’d soon be in her own grand lodgings. At least, she hoped that would be the case. Several months earlier, a troupe of actors had been performing The Taming of the Shrew in their little village before it went to the next county and Kitty had made herself known to the director, Mr. Lazarus. He’d looked her up and down in a very appraising way, then invited her to sit down and offered her biscuits and Madeira, something she’d never tried before and which made her feel quite lightheaded, and at the end of a very heartening conversation, he’d given her a very stylish London address where she could find lodging when she came to London to audition after his company returned to Covent Garden. Kitty knew the address must be stylish because Mr. Lazarus was a very smart gentleman, if a touch too flamboyant with his green felt hat and loudly-patterned waistcoat. But he was the man in charge, and he decided who would act in his plays and which actresses would take a lead role, their ticket to fame and glory. So when he smiled his very white smile, and smoothed his sideburns in evident satisfaction at the well-put-together package Kitty had tried to present to him, she knew she’d surmounted the first obstacle. Of course, her plan to become an actress in London was a huge secret she’d had to keep from her mother. She’d worked very hard at home, helping with the baby and household chores since she’d made up her mind, hoping to compensate in some small measure for the subsequent loss of her services, which her mother could not know about beforehand. Kitty and her mother were not close, and the baby was docile. Besides, why should Lissa be allowed to escape to a life far more exciting than village life—even if she hated being a governess—while Kitty, only a year younger and who dreamed of the excitement of the metropolis, was denied such opportunities? Now, as Kitty waited on the doorstep of this strange London abode for the response to her knock she felt a twinge of uneasiness, for the neighborhood didn’t look respectable at all; though just because one was poor didn’t mean one wasn’t respectable, she knew that very well.